"A combination of two of my favorite appetizers - I'm always asked for the recipe when bringing this anywhere." Preheat an oven to 350 degrees F (175 degrees C). 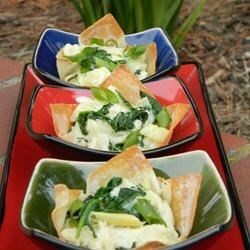 Mix mayonnaise, Parmesan cheese, mozzarella cheese, artichoke hearts, spinach, crabmeat, garlic, onion powder, black pepper, and white pepper in a bowl. Set aside. Place wonton wrappers into mini muffin tins and bake in the preheated oven until lightly golden, about 5 minutes. Remove from oven and scoop about 1 teaspoon of the crab mixture into each wrapper. Return to the oven and continue baking until wontons are golden brown and the filling is hot, about 5 minutes more. Garnish with green onions and serve immediately. I did not include artichokes but used yellow onions instead. It was so good!